73,6% of the freelancers signed a contract for their last project. With 81,3%, in almost every project with a publisher (big and smaller budgets) a contract is signed. Work-for-hire agreements are by far the most common type of contracts. 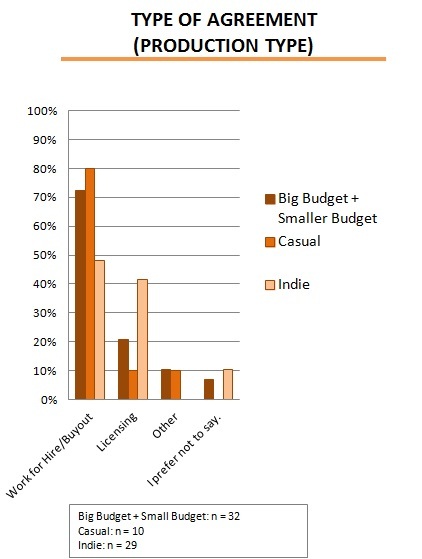 Only for Indie games, licensing agreements are a common option. Extra compensation besides the basic salary for employees or the basic fee for freelancers is not very common in the industry, for freelancers even less than for employees. For employees, a cash bonus (e.g. an annual bonus from their employer) is the most common extra compensation (37,1%). 14,1% of the freelancers received a royalty/payment per sold unit of the game, which is the most common extra compensation on their side. 54,1% of the composers are members of a copyright collective society. For 77% of the last projects, the music was not registered at a copyright collecting society, only 14% had the music registered. It is important to notice that membership and registration of music at a copyright collecting society can be more or less common in different countries. A closer evaluation of this topic in terms of different regions and countries is necessary.